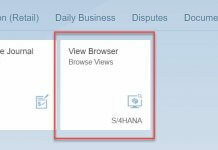 Dear SAPLearners, in this S/4 HANA technical tutorial we will show you how to identify technical name for a S/4 HANA fiori app. First of all, if a technical support person need to find implementation and configuration documentation of a standard fiori app, he need to search by app name in fiori apps library. The search results most likely will be more than 1 and he needs to spend some extra time to find the correct app name. To expedite and help technical person to troubleshoot fiori app from SAP S/4HANA 1709 there is a new feature and here comes the About icon. From S/4 HANA 1709, a new button added to the Me Area called About.A technical help dialog will open when you click on About icon. Lets see how we can use this feature to identify a technical name of a fiori app or troubleshooting fiori apps. 2. Now press About icon in Me Area. 3. A technical dialog appears like below which contains Technical Name, Version, SAPUI5 version, User Agent and App ID. 4. Now use technical name or App ID to search in Fiori Apps Library. Hurray!! now you have what you are looking for. You can even use App ID as well. This feature is also applicable for other application types like WebDynpro, Transaction. Congrats.! 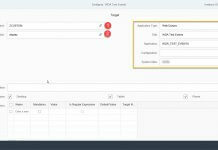 you have successfully learned how identify a technical name of a fiori app in S/4 HANA 1709 system. You can even use this feature for troubleshooting fiori apps.